The Triumphant Quartet will headline Gospel Winterfest with Soul’d Out Quartet and Katelyn Parker. New Destiny Productions LLC, based in Powell TN has announced another exciting Christian music concert, Gospel Winter Fest featuring the award winning Triumphant Quartet with special guests Soul’d Out Quartet and Katelyn Parker. This concert will take place on Saturday evening March 9th at 7 PM at First Baptist Church Lenoir City, TN just 12 minutes from west Knoxville. Doors will open at 6 PM. Triumphant Quartet was recently recognized by the Singing News Fan Awards with best Male Quartet, best Bass (Eric Bennett), best musician (Jeff Stice) and album of the year 2012 – Songs From the Heart. Their newest radio single, “TAKE IT FROM ME , MESHACH is receiving rave reviews. 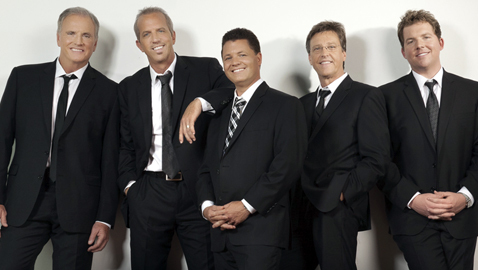 Formed in 2003, the then—named Integrity Quartet, began their ministry together at the Louise Mandrell Theater in Pigeon Forge, Tennessee. “I truly believe that God put this together,” said Ms. Mandrell of the new gospel group. The founding members, all residents of Sevier County, Tennessee and active members of churches in their community, brought a combined 80+ years of singing experience and their own enthusiastic fans. In 2004, the Quartet signed with Daywind Records, the premier Southern Gospel recording label. In December of that year, after a nationwide contest to submit entries, the Integrity Quartet changed its name to the Triumphant Quartet. Their commitment to their mission remained steadfast, and their success was just beginning. Russ Woolard, President of New Destiny Productions, says that every year, the Quartet and its individual members have been nominated for awards. In 2004, their single “I Bring You Forgiveness” was nominated for Top 10 song of the year by Singing News Fan Awards. In 2005, their CD “HomeFree” was nominated as a Top 10 Album of the Year. In 2006, their song “Don’t Let the Sandals Fool Ya” was #1 on the U.S. Gospel News Top 80 Chart and #6 on the Singing News Top 80 Chart. This song was also #15 on the 2006 Southern Gospel Music’s Song of the Year list. Their self-titled CD “Triumphant” was nominated as Top 5 Album of the Year by Singing News fans. In 2007, the Quartet received nine Top 5 nominations for Singing News magazine’s prestigious Fan Awards: Group of the Year, Favorite Album, Favorite Song, and individual nominations for all five members of the group. Scott Inman, baritone, was selected as the Young Artist of the Year. In 2007, Jeff Stice was voted the Stage Musician of the Year by the Southern Gospel Music Guild. He received the Harmony Award. This honor was voted by his peers. With all of the accolades and success, the men of the Triumphant Quartet keep their work in perspective. They are truly humbled and grateful for the support their fans have shown for their music and ministry. They reaffirm that their main focus is to keep God first in everything they do. The Triumphant Quartet’s powerful combination of talent, commitment, and unwavering faith insures that the years to come will bring even more success…in God’s name. Woolard says that also appearing is Soul’d Out Quartet, This group is young, energetic, and exciting. Their performance includes hymns with just piano, bass, and vocals, to progressive gospel with full tracks to back the vocals. They have a good balance of entertainment and ministry. The goal of this group is to encourage their audience to enjoy life and to set a positive atmosphere for the entire family while presenting a strong gospel message. Soul’d Out Quartet is a great act for ALL ages. They are upbeat enough to keep the interest of a teenager, while singing a few songs that grandma will know and love. Katelyn Parker is no stranger to New Destiny Productions concerts. During the 2012 concert season she opened for The Whisnants, Brian Free and Assurance as well as Ernie Haase and Signature Sound. Tickets can be purchased by calling 1-800-965-9324 or www.itickets.com or area Life Way and Cedar Springs Christian stores as well as the Praise 96.3 FM studios on Chapman Highway, Knoxville.